I absolutely love scones. Before my blogging days I had never made a scone in my life. I remember eating maybe one though and had enjoyed it, but that was about all I knew about scones. For those of you that follow my blog you will know that I am a carbaholic. I love the fact that scones don’t have yeast and they are a quick bread. After making my first scones last summer I have been hooked and am always on the look out for a new scone recipe. Now I wish I would have tried making them years ago. 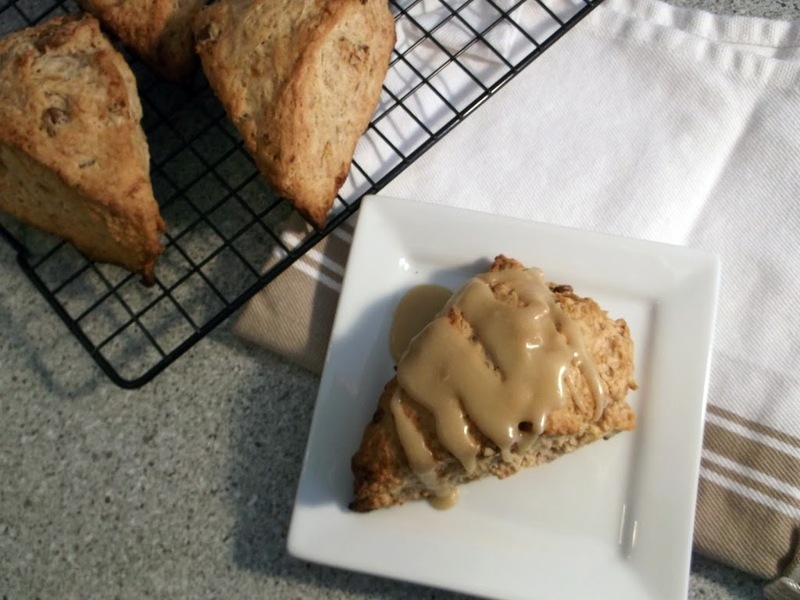 When I found this recipe for banana bread scones, I knew that it was a recipe that I would be making sooner or later. As I just stated I love scones, but I also love banana bread. So to get both of these breads rolled into one I knew this was for me. Plus the brown sugar glaze adds a little sweetness which is a nice addition. 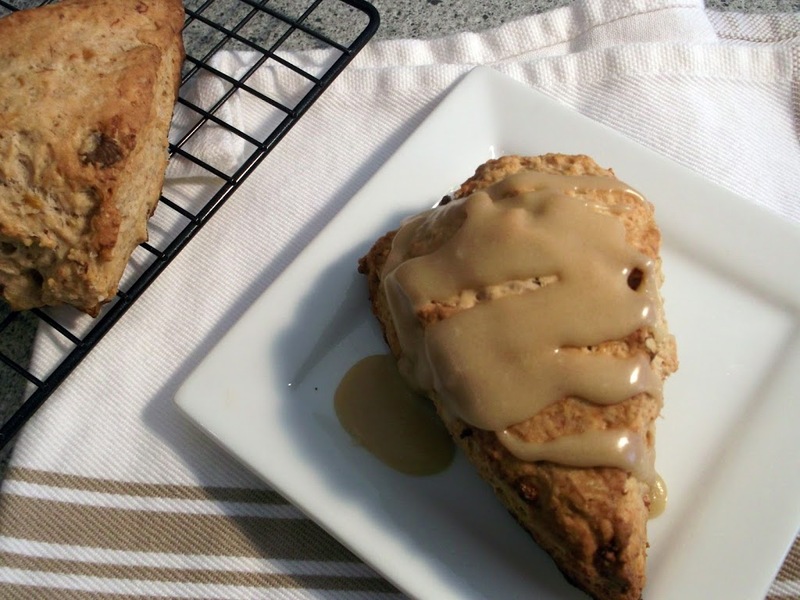 I have three words for these scones – yummy, yummy, and yummy!! Mash the bananas and then add enough milk to make one total cup (if necessary). Stir in the yogurt and set aside. Whisk together the flour, sugar, baking powder, salt, and cinnamon in a large bowl. Cut the butter into several pieces. Work it into the dry ingredients using a fork, pastry cutter, or your finger tips until there are no pieces of butter larger than a pea. Pour the banana-yogurt mixture into the bowl with the flour and stir just enough to incorporate all the flour. Fold in the walnuts, if using. This will make a fairly wet dough. Line a dinner plate with a piece of wax paper and turn the dough out on top. Pat it into a disk about 1-inch thick and cover with another piece of wax paper. Freeze dough for 30 minutes. Peel of the top layer of wax paper and invert the scones onto a parchment-lined baking sheet. Peel off the second layer of wax paper. Slice the scones into eight wedges and pull them apart a little to give them some room to expand. Bake for 25-30 minutes, until the scones are firm to the touch and turning golden-brown on the edges. To make the glaze, melt the butter and the milk in the microwave for 30 seconds. Add the brown sugar and vanilla, and stir until the sugar has melted (heat for an additional 30 seconds in the microwave if necessary). Whisk in the confectioner’s sugar, starting with 1/4 cup. Add more confectioner’s sugar if desired to make a thicker glaze. Just before serving, drizzle the glaze over the scones. The glaze will harden after setting for a minute or two, and can be served right away or packed for a later snack. The glaze can make the scones a bit sticky if kept for longer than a few hours, so store any scones to be eaten later un-glazed. 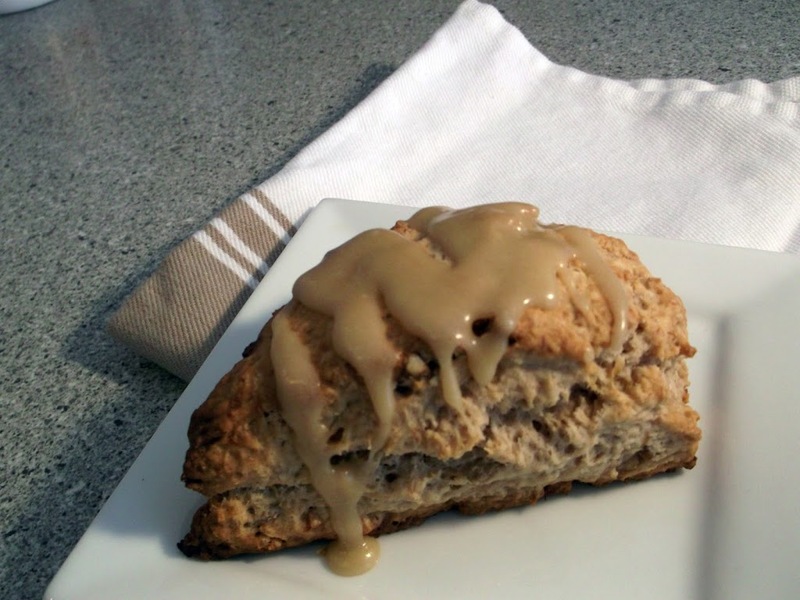 Extra un-glazed scones can also be frozen and re-heated in a microwave or toaster oven. Wow! Those look and sound AMAZING! They look absolutely delectable! I had these on my list to make since I first saw them on the kitchn! I love scones and banana bread too.